Two Scenarios packs have been published by the Winnipeg ASL Club. They are described below, along with instructions on how to purchase them. 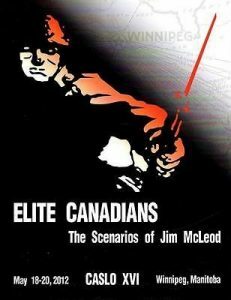 The Elite Canadians Pack was created out of two desires: To create a scenario pack to be sold at the Canadian ASL Open tournament in Winnipeg in 2012, and to honor the work and memory of one of the leading lights in the Canadian ASL community, Jim McLeod. While brainstorming ideas for hosting the 2012 CASLO, the Winnipeg ASL Club hit on the idea of re-releasing the scenarios that Jim McLeod created for the Maple Leaf Route, an ASL newsletter that he was the creator, editor, and main contributor. During the re-playtesting of these scenarios, we discovered that there were a few scenarios that Jim had not yet published, and it was agreed to add these to the pack. The scenarios were laid out to give them a more modern look, existing errata on the Maple Leaf Route scenarios was incorporated, and the new scenarios playtested and polished. The Winnipeg ASL Club is very proud of this scenario pack, and hope that we have done justice to the scenarios of our friend and mentor, Jim McLeod. You may purchase this at the Sitrep site here. 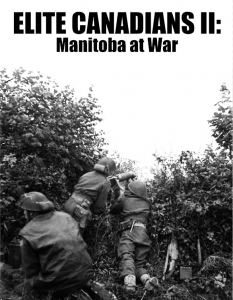 The scenarios in this pack feature three units from Manitoba and a sampling of actions in which they participated from the Normandy landings to the end of the war. Three of the scenarios include the Royal Winnipeg Rifles, nicknamed the “Little Black Devils” in 1885 for their prowess at the Battle of Fish Creek during the Northwest Rebellion. One of three battalions comprising the 7th Infantry Brigade of the 3rd Infantry division, the Rifles formed part of the D-Day invasion force. The tanks that were to support them were delayed and the Rifles suffered significant casualties on D-Day as a result. Once the tanks arrived, the Rifles pushed inland further than expected. The first scenario takes place two days after D-Day and reflects some of the challenges in coordinating the advance inland from the beaches. The Rifles are on the extreme right of the 2nd Canadian Corps. There was no contact with the 50th Infantry Division of the neighboring British corps advancing from Gold Beach, so the Rifles’ flank is open. It was at this time that the reinforced 2nd battalion, 26th Panzer Grenadier Regiment of the 12th SS Panzer Division (Hitler Jugend) attacked. In “Rolling Out the Carpiquet,” which takes place about a month later but only 10 km from Putot-en-Bessin, the Winnipeg Rifles and B Company of the Fort Garry Horse combine to seize the Carpiquet airfield. The Fort Garry Horse, also known as the 10th Armoured Regiment, was one of three regiments comprising the 2nd Armoured Brigade of the 5th Armoured division. In this scenario the soldiers from Manitoba again face the 26th Panzer Grenadier Regiment. The third scenario is situated about 700 kilometres east of Normandy, in winter. The qualitative erosion of German combat units is evident by the mixed bag of defenders, ranging from elite Fallschirmjäger to exhausted Landser. The inclusion of the 1st Canadian Armoured Carrier Regiment in “Kangaroos in Louisendorf” reflects some of the tactical innovations introduced since the D-Day landings. The final scenario is set in The Netherlands in the spring of 1945. Here the 12th Manitoba Dragoons, also known as the 18th Armoured Car Regiment and part of the 2nd Canadian Corps complement, forms a spearhead in the liberation of The Netherlands against an uncoordinated German defence. Even though it is clear that the end of the war is near, the unpredictability of the German defenders introduces significant risks for the lightly armed Dragoons and French SAS Paratroopers. These three units were not the only units coming out of Manitoba. Another Winnipeg battalion, the Winnipeg Grenadiers, formed part of the ill-fated Hong Kong garrison overrun by the Japanese in the December 1941 (see “Hana-Saku,” MLR01, from the original Elite Canadians pack). Credit for the quality of these scenarios is due to all those who commented on and play tested them. This includes, in alphabetical order, Paul Asselin, Blake Ball, Bill Bird, Josh Gilbert, Eldon Hemminger, Steffen Knippel, Lawrence Lee, Ron Levreault, Paul Suderman, and Mike Suderman. Limitations or failings of the scenarios are my sole responsibility.